The purpose of the initial appointment is to understand your "needs and wants" as a buyer because we will need to know exactly what you are looking for in a home. We will also discuss your timeline for finding a home, share information with you about the state of the current real estate market, and show you some of the recent sales prices so you will know how much you can expect to pay for the type of home you are looking for. This may be the most critical meeting of the home buying process. It's important to talk with a mortgage professional so you can know how much house you can afford based on your down payment, credit history and income. Remember that you don't always need to put down 20 percent as your parents once did. There are loans available with little to no down payment. An experienced mortgage professional can help you understand all of your financing options. In a strong Seller's market where you could end up competing against other Buyers for the home you want, a pre-approval will greatly enhance your negotiating position and the strength of your offer. 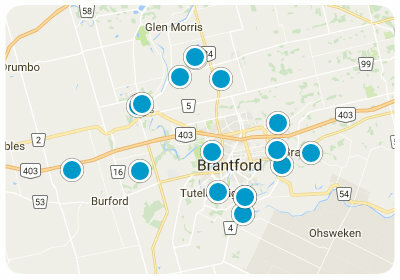 We can provide you with the names of reputable and experienced mortgage professionals in the Brantford area. Make a list of the most important things you will need to have in the new house. Ask yourself how many bedrooms and bathrooms you will need and get an idea for how much space you desire. How big do you want the kitchen to be? Do you need lots of closets and cabinet space? Do you need a big yard for your kids and/or pets to play in? Once you've made a list of your must-have's, don't forget to think about the neighbourhood you want to live in, the types of schools in the area, the length of your commute to and from work, and the convenience of local shopping and amenities. You should also take into account how well the home values appreciate in that neigbourhood. Now that you've found the home you want, it's time to make an offer. We will show you how much the comparable homes in that neighbourhood have been selling for and give you our opinion on the value of the home. We will also prepare the Offer for you with the necessary conditions that protect your best interests, go over all of the fine details in the Offer with you(including all of the clauses and conditions in the Offer), and negotiate the Offer on your behalf. Once you've made your offer, the Seller has the option to accept, reject or counter your Offer. In most cases the Seller will make a counter-offer, and now you will have the option to accept, reject or counter the Offer. As soon as the Seller and you have come to an agreement on the price and terms of the Offer you will be required to submit a deposit cheque that will be deposited into a real estate trust account as a sign of good faith. Now that you have an Accepted Offer on the home you want to buy it's time to work on fulfilling the conditions in your Offer. The first step is for you to get the financing in place for you to be able to purchase the home. We will send the MLS listing information for the property and a copy of the accepted offer to your mortgage professional. As soon as the financing has been approved we can talk about booking the home inspection and any other necessary inspections in order to fulfill the remaining conditions in the Offer. If all goes well with the home inspection(and any other conditions that we felt were necessary for that particular home) then you can sign the "Notice of Fulfillment" in order to fulfill your conditions, which will make your Offer an "unconditional" or "firm" Offer and the home is sold. Congratulations on your new home! Now we will send all of the paperwork to your real estate lawyer so they can perform the title search, etc.. before the closing date. Your lawyer will set up a meeting with you before the closing date to review and sign the paperwork for the purchase of the property. Closing costs will likely include (but are not limited to) your down payment, title fees, appraisal fees and lawyer fees. Your lawyer will tell you to bring in a certified cheque for the funds necessary to close the transaction. On the closing date you will receive a phone call from your lawyer's office after the deal has closed and as soon as the key to your new home is ready to be picked up. Congratulations! You now have the keys to your new home and it's time to move in. You can start unpacking your belongings and begin to enjoy your new home! Buying a home doesn't have to be a hassle if you're prepared and you know what to do, how to do it, and when to do it. Choosing an experienced and knowledgeable real estate agent is the key to helping you have a smooth and enjoyable home buying experience!